In the spirit of full disclosure, I feel it is important that I start by saying this. At times I feel and even think I learned how to ride before I could even walk. If only I hadn’t paid attention to my biology, this would be a belief that no one could shake. After my first bike (my parent bought me a pink tricycle which required them to push me around every time I wanted to ride), I got newer versions every time I outgrew my current one. When it got to a point where I stopped growing tall, I shifted to improving my bike technology every so often. I had to save hard to get the newest upgrade and trust me it wasn’t easy. With all the riding I have been doing through the years, I have managed to stay in perfect shape. But aside from riding, believe it or not, I have a life, a family and a career that gets more and more demanding every day. 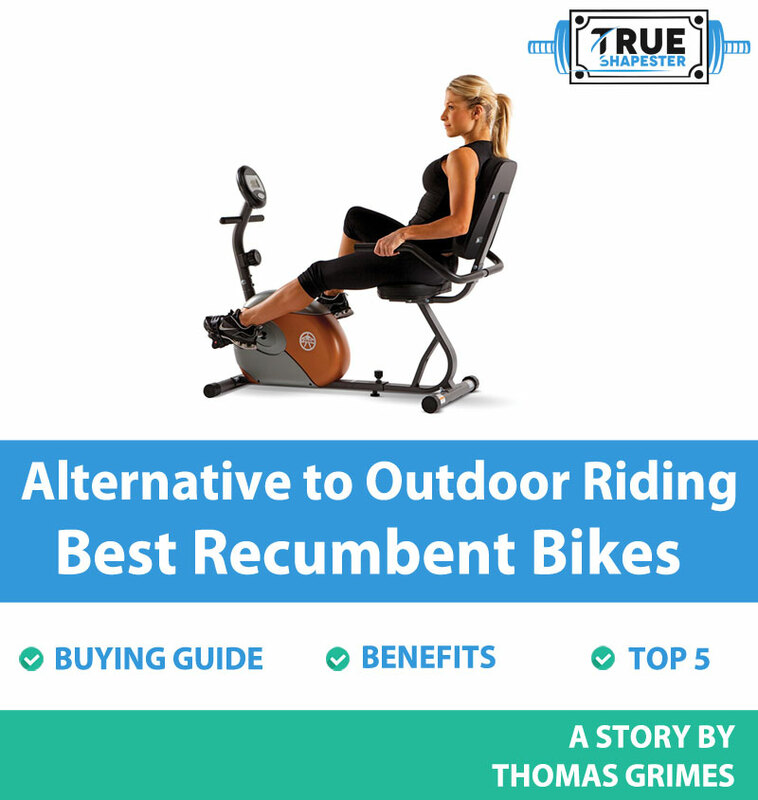 What to Look for When Buying Recumbent Exercise Bikes? With the added responsibilities of work and a family that needs my attention, my riding time was getting eaten up slowly but surely. Things got so bad that I only had about 30 minutes to myself which when you factor in riding home from work and getting ready for the ride only left me with about 15 minutes. Now, you probably are wondering how this could be the worst thing in the world. The truth is, most persons could care less, but for me, a person who practically rode her way around life, this was a disaster, a nightmare. Something had to be done; fast. So, exactly three months ago I started looking into alternative options to outdoor riding. I knew I would get what I was looking for, but nothing really prepared me for the overwhelming results that Google threw at me with every keyword I searched. It wasn’t long though after I had started my research that I stumbled upon recumbent bikes (more on this later). They seemed like the best solution to my problem, but now the discovery presented a whole new set of challenges with it. The thing was, the market was flooded with these seated exercise bikes. All of which featured different technologies and designs. Making a choice of which best would suit me seemed impossible, especially since I did not know head or tails of what made the best rated recumbent bikes. Long story short, it took me a while but I finally landed the bike of my choice. But before we get into the decision I made, which by the way, catered to my long riding needs and helped keep me in shape, it important we start this guide the old fashion way. If you are reading this, you obviously have a clue what a recumbent bike is. You probably have encountered them many times at the gym or watched you favorite fitness guru display on his/her Instagram page. But for the sake of those who might not know what they are, we shall describe them in the simplest way possible. Recumbent cycles are exercise bikes designed to be stationary and used in the comfort of your home. They are designed to provide ample support and comfort for your back. They are convenient and you can even use them while watching your favorite TV show. Aside from the fact that these machines are super comfortable (some users say they are more comfortable than regular bikes), they have numerous other benefits you will do well to remember as you prepare to make a purchase. Most exercises tend to apply great pressure on the lower body joint, especially on the back. While the pressure may not seem harmful at first, with time, as your exercising intensity increases, more and more pressure is applied to this area resulting in excruciating pain enough to cause you to quit exercising. ​Recumbent exercise bikes, however, have your back in a super comfortable position as you cycle away. You can spend prolonged hours on the machine and not develop back pains. Of course, being an exercise machine, this unit is bound to help you burn calories. You should know, however, that many calories you burn will depend on how hard you exercise and your fitness levels. Translated into figures, this unit can help you burn hundreds of calories in just an hour. The exercise might seem as easy as taking a stroll in your favorite park but the calories and fats you burn will be evident in a few weeks. You also will build muscles in the process. The mere fact you will burn so many calories in an hour’s time is proof that the recumbent exercise bike is a perfect tool to provide you with a great cardio workout. Studies ﻿﻿that ﻿﻿have been conducted reveal that for every twenty minutes spent on a exercising, your heart rate increases and gradually builds a resistance to coronary heart diseases - all this at the comfort of your home. 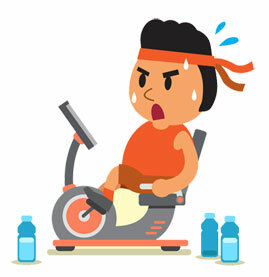 When you are feeling stressed out and you just feel you need to let off some steam, exercising is the best option. In this case, exercising on a recumbent exercise machine is your best bet. Well, unlike chugging down glasses of beer, smoking or stress-eating, exercising on a fitness bicycle will get your endorphin levels high and help to reduce the symptoms of your depression. Basically, you will spread the love by building muscles. One of the biggest benefits of purchasing this indoor workout unit is that you will save a great deal of cash in the process by not going to the gym and paying memberships. You will also save money on gas since you will no longer have to make the long trips back and forth. and basic consoles at the very least. But even with these similarities, the differences are numerous. It is these differences that create the need for a buying guide. That said, below are some of the factors that you will need to consider when choosing a bike trainer – one that will suit your needs down to the letter. In this day and age, when economies all over the world are unstable and individuals have to work two or more jobs to at least afford some luxuries, price of goods to be purchased becomes a major decision-affecting factor. Before you even set out to the malls or open up our online and visit online shops, you should first decide how much money you are able and willing to spend. There are numerous bikes on the market and you are bound to land one that is well within your realistic price range. Whilst you are making the choice of how much you are willing to spend, you should have in mind that the price a unit fetches will affect the number of features that a unit sports. Expensive bikes have more functional and technical features, unlike the cheaper options. But generally, with $200, you should be able to land a indoor bicycle that has a perfect mix of features, longevity and an affordable price tag. If you could care less for the set programs and are looking to pedal away by adjusting the resistance as you exercise, you have numerous options. Also, you will not have to part with huge sums of money as many of such bikes are considered to be entry level bikes. Provided you will not want to have a high resistance on the bike, you will be well on your way. Pre-set programs feature profile programs that alter resistance levels. The variations are done automatically though there are other still that require you to make the changes manually. In addition to this, some units have heart rate control programs. These programs will alter the resistance of the unit to help keep your heart rate in a specific zone. There are bikes that are designed to work with Bluetooth technology along with Fitness Apps that you can download on your mobile devices. These bikes provide more exercise options. Bikes with these functionalities are fun. However, they are more costly than others. Many of these can go higher than $1000. And those that fetch prices lower than this may not present great delivery. Different bikes come with varying weight capacities. There are those that can support individuals with weights up to 300 pounds and those that go even higher. If you are heavier, you should prefer that with a higher weight capacity. Also, if you will be sharing the bike with heavier persons, it is important to get a wider weight range so as to accommodate all who will be using the unit. Many cycles designed for home use are small and can be stored away with great ease. They also have low weight to allow for portability. If you are working with a small space in your home, you are better off getting a unit that has a foldable design. You should, however, note that these units may not have comfortable seats or legs. But all in all the design will be perfect and will provide you with excellent service. For those individuals who are between 5ft 2 inches and 6ft. the options are wide and varied. Outside of this height range, however, the options get scarce and finding a perfect unit becomes more and more difficult. But this is not to say that you will not get a perfect fit – on the contrary, with some patience and considerable research, you are bound to land the very best on the market. There are days you will need to exercise on hard resistance and there are times you will need light resistance. To help accommodate these days perfectly, you will need to choose a unit that has adjustable resistance in the ranges that fit you. Units with variable resistance make perfect units for beginners who are looking to start low and work their way up to the tough workouts. The Schwinn 270 is one of the top most products from Schwinn. It is a mid-priced workout exercise bike that features 29 workout programs on its console. It comes with an adjustable seat that is perfect for a wide range of individuals of different sizes, has oversized pedals, a USB port coupled with speakers for entertainment during a workout and also to allow you to upload workout fitness data into your fitness accounts. The bike is constructed with a sturdy steel frame and does not wobble during an exercise. The unit features 3 levelers for even balancing and has a 10-year warranty for the frame. Adding to this, the bike can accommodate individuals within the height range of 4ft 11 inches and 6ft 3 inches perfectly. The height range is made possible courtesy of the adjustable seat. As for resistance, the unit features 25 levels of resistance – magnetic resistance. This type of resistance makes it quiet and run smoothly. You can control the resistance levels by using 10 quick press buttons available on the console. The unit features 13-pound perimeter flywheel that is weighted. This unit helps to pull pedals through all levels of resistance to ensure the unit as a smooth pedaling motion. Individuals with knee injuries will benefit most from this unit. Overall, Schwinn 270 is one of the more impressive low priced bikes. The unit offers many programmed workouts and works perfectly with wireless chest straps. In the event you find the 17-pound drive can support your fitness needs, then the unit is an excellent choice. This is a top rated semi-recumbent folding exercise bike that goes for an affordable price. The unit is termed as a semi-recumbent bike since it features an upright design and that of a recumbent bicycle as well. The bike has been constructed to be lightweight and foldable complete with narrow stabilizers. The unit weighs 39 pounds and is 19 inches wide. Despite the size, however, it is quite sturdy and strong. For its adjustability, the unit can be used for persons with heights between 5ft 2 inches and 6 ft 2 inches tall. The resistance of this unit is set by turning a knob located just below the console. The magnetic pads designed to control the resistance either move closer or further away from each other to increase or decrease the level of resistance. It is driven by a V-belt drive system that delivers smooth riding experiences and the grip on the flywheel and pedals have no slippage. The unit is quiet and needs no maintenance. Being a foldable unit, it can fold up to half of its size and fit in closets. On the console, the unit displays distance, time, speed, calories burned and heart rate if you have the hand pulse sensors connected. You can choose to see only one of the measures after every 6 seconds. If you have a small space to work with at home, this folding exercise bike will prove to be the best unit for you. It is reliable and robust thus providing excellent value for money. This is a popular horizontal exercise bike that with a high rating on the market. The unit goes for an affordable price. It features 8 levels of resistance and features a magnetic resistance system. The resistance is varied by a turn of a knob. To have you motivated as you exercise, the unit has a metric display that is conveniently placed to display your performance during your exercise. On the metrics you can see you cycling speed, the amount of time taken to exercise, distance cycles and the amount of calories burned. The pedals are sturdy and solid allowing for easy cycling at different speeds as well. Each pedal features deep grooves on the surface which increase traction and provide a strong grip. The seat and handlebars of this unit come padded to increase the comfort levels and reduce stress applied on the back and the joints. The seat can be adjusted thus allowing persons of varying heights to make use of the unit. Overall, the unit performs great. Being a low impact unit it is perfect for persons looking for both light and moderate levels of exercising. The unit is easy on the knees and many admire its comfort levels. This unit has been on the market for quite some time now. But even then, the unit has remained to be one of the most affordable recumbent bikes in its class. It features the new sliding and adjustable seat frame design. The adjustments are easy to make on the seat and allow persons of varying heights to make use of the unit. The bike has a magnetic adjustable resistance that is coupled with a motor drive to provide impeccable performance. On the front of the unit is a console that can be programmed. The unit comes with 17 inbuilt training programs for kick start beginners in the new world of sit down exercise bikes and comes with an inbuilt hand pulse and heart rate monitor. For comfort, the unit features two ergonomic handlebars for great comfort as well as to easily accommodate a variety of workout positions. The seat is cushioned and has a high back for added comfort during a workout. This unit may not be the best in providing fancy features but it does get the job done with regards to delivering good aerobic workouts. This is a unit that has proven its worth time and time again. The unit has been constructed from solid steel and exercises the legs, arms and the core without impacting the joints harshly. This unit supports whole body workouts when engaged at between 70% and 85% trainee’s maximum heart rate. The sturdy steel frame of this unit provides the bike with a 250-pound weight capacity. The unit itself weighs 120 pounds. Working out on this unit is comfortable since it has a padded seat with side handlebars for stability. The seat is also adjustable to accommodate persons with varying heights. Since the unit runs on magnetic resistance systems, the machine runs quietly and smoothly. But even in its quiet nature, it is still highly functional and effective. On the front of this unit is a monitor used to provide feedback on the distance, speed, time elapsed, calories burned and heart rate. These functions help you to better keep track of your progress. The monitor console is battery powered and as such requires no electrical connection. This is a great reclining exercise bike given that it works out the upper body and the legs as well. The adjustable seat both vertically and horizontally is also an added plus. At this point, you should be in a position to make a well-informed choice of the unit that will best suit your needs. That said, in the list provided above, though all are of great value, the Schwinn 270 stands tallest of all. The unit has an edge over all the others courtesy of its 29 inbuilt programs, 25 levels of resistances while others have only 8 and the fact that it is fairly priced. With this unit, you get great value for your money.